If you’re looking for a great place to get your nails done, Washington is home to an abundance of excellent options. Whether you just want a simple manicure or if you need a long-lasting gel treatment, these awesome nail salons will have you looking great for every occasion. Here are our 10 favorites. Apollo Nails and Spa is not your ordinary nail salon. Located in Seattle, Washington, this body care business has established itself as one of the premier places for full body treatments from head to toe. With two convenient locations all around the city, they make customer satisfaction a priority. You can select from several types of nail treatments including a tension-reducing massage and reshaping of your nails plus polish, a deluxe manicure with a special paraffin treatment, an organic treatment that uses various natural and earthy products that add smoothness and vibrancy to your nails, or the special spa manicure that provides hand-softening techniques to remove dead skin and moisturize your hands and nails. Kids can enjoy a mani/pedi treatment, too. Offering the best in men’s haircuts and nail services, customer service is a top priority at Lee’s Barber and Nails in Olympia, Washington, but you’ll get more than great service at this unique shop located in Olympia, Washington. Pricing is reasonable, and there is free on-street parking in front. Old-fashioned, efficient, and one of the area’s hidden gems. 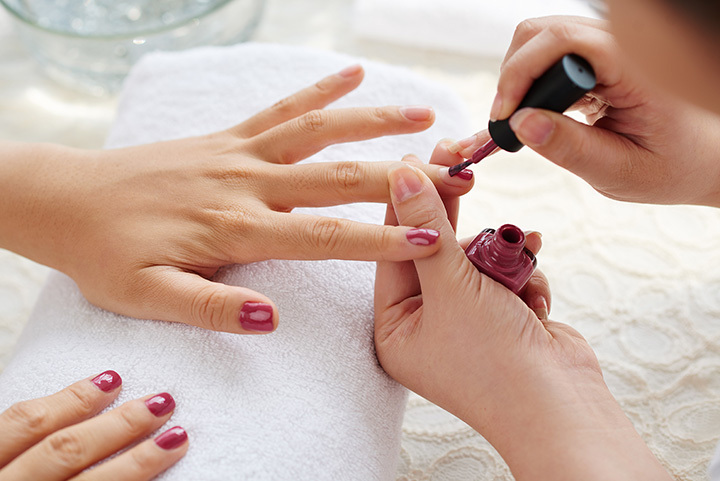 Located in Gig Harbor, Washington, Bella Nails & Spa is the perfect place to pamper yourself. You’ll be treated like family when you stop by for a set of acrylic nails, massage, or manicure/pedicure services. You can also enjoy a glass of wine or a mimosa while you’re waiting, and you won’t find friendly or more professional technicians than here. Open every day, you can be sure you’ll get the perfect color for your nails, and recommendations for future treatments. Open from 9:30 a.m. until 7 p.m. every day except Sunday, Mina Nails in Lakewood, Washington, is relaxation at its best. This family-owned and operated salon treats everyone like family, making it one of the most popular local spots for nail care. You’ll never feel rushed, and your satisfaction is the main concern with all the little things that are done for customers, like the neck and arm massage with each manicure. Clean, friendly, polite, and efficient. Those are the words used on social media sites for BK Nails Spa located in Normandy Park, Washington. If you’re particular about the nail service you like, look no further. The helpful technicians will guide you to the best services and products for great nail care, and always have your satisfaction as their priority. Whether you’re coming in for your regular appointment, or have a special occasion to attend, you’ll get excellent service in the comfortable and convenient environment. If you’re new to the Renton, Washington area and are in need of a great place to have your nails done, Glamour Nail Spa is just the place. Open every day but Sunday, this little salon opened in 2013 and has been going strong ever since. With special attention to problem areas around nail beds and cuticles, they’ll have you looking good in no time. Highly recommended on social media. If you’re looking for a place to stop for nail care, the name says it all. Stop 4 Nails in Bellevue, Washington, is your one-stop salon for all things related to nails. Open every day, you’ll never feel rushed, and your service is comfortable and relaxing. Friendly and pleasant, Stop 4 Nails will give you the best gel or shellac treatment ever. If you want to tell if a nail salon is good at what they do, just ask the people who keep coming back time after time. That’s what you’ll find at Luxury Nail in Burien, Washington. This salon is more than just an average place to get your nails done. The technicians here treat your nails with tender loving care, and watching them work is like watching the performance of a fine craft. Traditional manicures and pedicures are done here, but there’s also the opportunity to try something a little more trendy and fashion-forward. The award-winning Nu-Yu Salon & Spa has been serving the area for the best in nail care and spa services for over 20 years. Located in Spokane, Washington, this friendly staff will help you look and feel your best every day except Sunday and Monday. Various massage therapies are available to compliment your nail services, and you’ll walk out feeling like your feet are on pillows after a mani/pedi here. Show your wild side with some of the new nail treatments and salon services available at Star Nails in Puyallup, Washington. You’ll never find your nails boring again when you visit this little shop that’s been around for over 25 years. With leading products and services available to make your nails look their best, you can count on getting the best customer service for the price. Using professional products like gels and acrylics, you can pick up supplies to help you keep that great nail look at home longer.